Jurist notes on former PM's court victory, but says even one day in jail for him has great meaning - although state secrets complicate that. 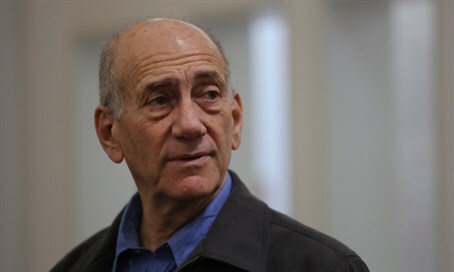 Jurist Dr. Chaim Shtenger spoke to Arutz Sheva on Wednesday about the upcoming imprisonment of former Prime Minister Ehud Olmert, who is due to begin his jail term in February for corruption charges. Olmert had been sentenced to six years in jail for two bribery charges, but the Supreme Court partially accepted his appeal Tuesday and exonerated him of the bribery charges in the infaous Holyland affair. He was sentenced to 18 months, but is expected to serve under 12 months in jail, assuming a third of his sentence is knocked off for good behavior. "This is a big win for Olmert, instead of six years he is getting a year-and-a-half, and that can be reduced by a third," said Shtenger. "There is an implied criticism here of Judge (David) Rozen, because the Supreme Court didn't just get involved in the punishment, but also in effect canceled the corruption clause from Holyland and ruled that Judge Rozen was wrong." The jurist noted that "Judge (Neil) Handel ruled that it cannot be determined with a certainty that Olmert received bribes in the main conviction clause. But in this trial, even if the king won, the king remains alone, he won in battle but even if he enters jail for just one day, a former prime minister is going to jail." Shtenger noted that jailing a former prime minister is a complicated matter; given that he has been privy to the most sensitive state secrets, the Israel Prisons Service (IPS) renovated one of the blocs in Ma'asiyahu Jail in Ramle and readied it for prisoners who must be separated from the rest of the prison population. "This is a former prime minister with serious state secrets, so what they'll do is put him into isolation, it isn't a simple operation but there is a way to get rid of this headache: they can turn to the president to give a pardon and reduce the jail to a half-year of public service or give him a full pardon, that depends on the lobby," said the jurist. "Maybe they will come and succeed in convincing the president of the state to give him an ease (of sentence). That will get rid of this headache." In the special new prison bloc, Olmert is to enjoy deluxe conditions, including a television in each cell, the right to subscribe to a newspaper, and being allowed to wear civilian clothes.